Brief tutorial: how to video chat? 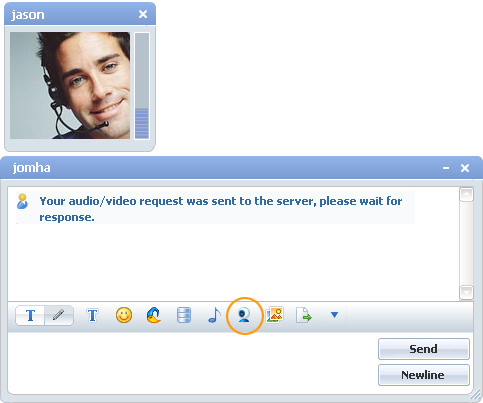 This is a simple tutorial for webmaster and end chat users, about how to use video chat in 123 Flash Chat Software. In a chat room with the A/V module enabled, there is a webcam icon in the top menu. When you move the mouse over the button, a prompt will appear and say "Publish my video". Click this line to go ahead and publish your own audio/video. You can select or unselect those checkbox so that you can decide whether to share your camera or voice or not. If you need to share your audio continuously, please check the Hands Free box. If you only want to speak, you can uncheck the Hands Free box and click on Talk to speak. Move the mouse to the bottom right of the video window. You will see an arrow indicating that this window is resizable. Drag the window to the size you want. The blue bar to the right of the video is the volume bar, showing the volume of the microphone and speaker. 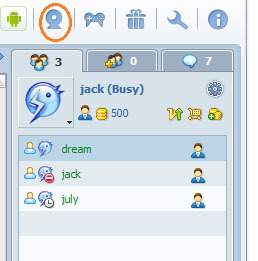 The webcam icon is visible after a user's name in the userlist if he/she has already published their audio/video. To see that user's video, click the icon. After you've published your video, other users will see a webcam icon next to your name. If you just want to publish your video to a specific user instead of the whole chat lobby, activating a private chat window by double clicking his/her username first. The "Publish my video" webcam icon will appear in the menu above the input area. Using this method, no users apart from the user you specified will be able to view your video. If the receiver wants to show their video to you, they will also need to click the "Publish my video" button to publish their video.